Supports 5 classic effects: reverb, chorus, flanger, overdrive and wow wah. With 3.5mm audio output, can be directly connect to speakers or headphones, and the output volume can be adjusted by volume switch. Supports BT connection, background music can be input wirelessly via your smartphone or other audio device with BT. 6.35mm rotatable plug available for guitars with input jack in different positions, flexible to use. 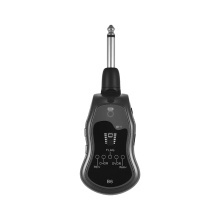 Built-in rechargeable 800mA lithium battery, allows you to use it anytime and anywhere. The guitar and amplifier showed in the picture are not included.